What image comes to mind when someone says “sunset”? I think of the sky being set on fire with warm colours like the bottom painting. On the other hand, my husband automatically assumes a more subdued, twilight colour scheme like the top one. These are 2 colour palettes I’ve been mucking around with to prepare for a 24″ x 72″ acrylic landscape painting. See old sketches and plans here. Be attentive to all the gradients! The water is dark to light from foreground to background. 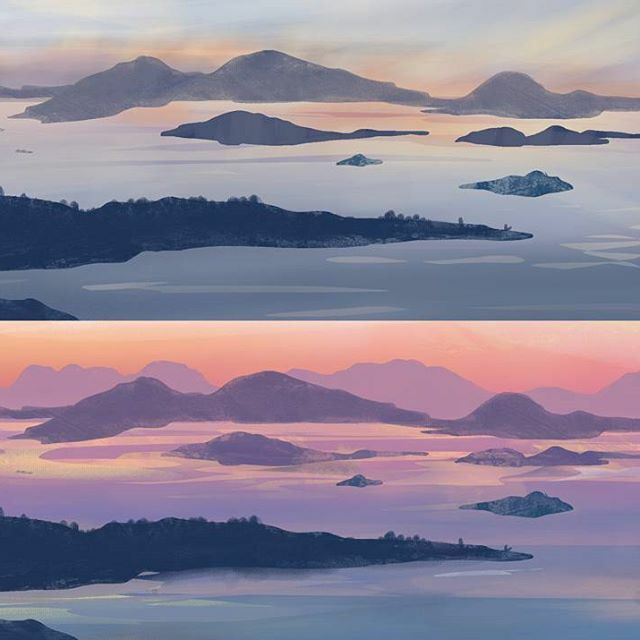 Ensure the gradients are solid on the canvas before moving on and painting island formations. The sky is your light source and should always be your lightest value. Reflections from the sky into the water will be just as bright as the sky. Ensure your values are accurate to depict this! Control hard/soft edge use. Soft edges for gradients, hard edges for islands, and water ripples and reflections.